In part two of our four-part series on common assumptions, among biotech companies about the HTA process and market access, we tackle the second assumption regarding regulatory approval. The data collected and submitted for regulatory approval will be sufficient for HTA and reimbursement. Just like in the US, market access in other countries happens rapidly after regulatory approval. Global market access planning begins after phase III clinical trials. If my clinical results are great, I don't have to worry about cost. The health technology assessment (HTA) process takes time, but how much delay in market access should you expect? The time it takes for an HTA agency to issue a reimbursement decision can be a major factor in the overall market access timeline. While HTA agencies publish timelines to set an expectation, those timelines are not always adhered to and decisions that take longer slow down speed to market. This can result in significant business repercussions for the manufacturer including decreased ability to gain market share and increase in time to revenue generation. So, when formulating a market access strategy, an understanding of the observed time for decision versus the published timelines can help to plan and set appropriate expectations. We also want to identify other important factors of market access that take place after a decision is issued and have the potential to affect market access. Based on the published guidelines and methods of the bellwether HTA agencies Context Matters tracks, time to a reimbursement decision can range from 90 days from the manufacturer’s dossier submission for HAS to 245 days from the start of the HTA process to the decision for NICE. Looking at all the agencies combined, the average time to a decision is around 158 days or a little over 5 months. Do these estimates stand up in practice? 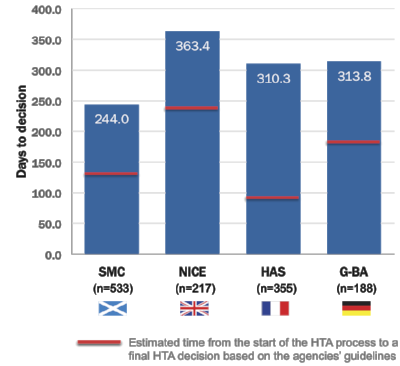 In an analysis, we examined the average time to reimbursement decision after EMA approval for the European HTA agencies tracked in the Context Matters Market Access Platform (MAP). First, we matched the EMA label indication to the indication under HTA review to ensure we are comparing apples to apples. We subtracted the EMA approval date from the date of HTA decision to calculate the time to reimbursement decision. We looked only at the first submission of the drug and indication so that those drugs that were resubmitted or reassessed did not skew the length of time to a decision. The average days to a reimbursement decision were longer than the estimated time to a decision, as reported in the agencies’ guidelines. The bars represent the number of days between the EMA approval and the HTA reimbursement decision. The red line indicates the estimated time to a reimbursement decision as reported in the HTA agencies’ guidelines and methods. The analysis shows the average number of days to a reimbursement decision is longer than the published estimated time to a decision for each HTA agency. NICE had the longest average time to a decision and SMC had the shortest. Interestingly, HAS has the shortest estimated time to a decision (around 90 days) within their stated guidelines, but SMC had the shortest actual time to a decision which was around 244 days. However, SMC’s actual time to a decision is significantly longer than their estimated time to a decision. There are currently other ways to examine this time to reimbursement data, but in this high-level analysis gives us a clear sense of the difference between the estimated time to a decision and the observed time to a decision. The long spans in time to a decision between agencies and between estimated may give the impression that market access is delayed in all agencies. However, there are some important factors to consider. In almost all cases where EMA approval to time to a reimbursement decision was evaluated, the respective agency’s time estimate begins when the agency receives the manufacturer submitted dossier. Manufacturers do not always make their dossier submissions promptly after regulatory approval, creating a delay in the time to an HTA decision within our analysis. Another important factor is how long it takes from the HTA decision to the time of reimbursement. This requires consideration of the place of the agency and their decisions within the health care system. In Scotland and Canada, SMC and CADTH/pCODR respectively review all newly approved drugs and each agency makes a recommendation to the local NHS boards or provinces. The NHS boards in Scotland and the provinces in Canada make the final determination as to what drugs will be included on their formularies. Before drugs are accessible for reimbursement, the drug has to go through the HTA process. Our projections are likely underestimates because they do not account for the time it takes the local boards or provinces to make decisions regarding reimbursement. Similarly, in France, HAS reviews all medicines newly approved by the EMA to determine the level of benefit the drug provides (the SMR and ASMR scores). After the HTA is completed the drug goes through pricing negotiations, which can take up to an additional 90 days. So again, time to patient access of the medication is likely longer than the time it takes to complete the HTA assessment. On the other hand, NICE and G-BA allow the drug to be reimbursed before the HTA assessment is complete, if one is completed at all. Remember, NICE does not review all drugs, only those that have significant benefit to patients and those that are likely to have a large budget impact. So if the drug is not assessed by NICE it can still be available for reimbursement. In Germany, the product is available at launch for the manufacturer’s price. Once the drug goes through the assessment process and the additional benefit is determined, a more formal price can be set. Drugs with no additional benefit must be added to a reference group within six months of market launch. If a reference group cannot be identified, a reimbursement price is agreed upon. If additional benefit is proven, the Central Federal Association of Health Insurance Funds negotiates the price with the pharmaceutical company within six months. So within the UK and Germany, reimbursement is not held up by the HTA assessment. As we have seen, the published estimated times are significantly shorter than the actual time to a decision after EMA approval for all agencies. However, there is a range of factors that determine how long the HTA assessment takes and how long it takes the drug to reach patients and be reimbursed. Time to a decision and time to reimbursement are important considerations for manufacturers, policymakers, and patients. In order for manufacturers to ensure the quickest time from EMA approval to the drug’s reimbursement, the manufacturer should be aware of current trends in time to decisions and needs to understand the HTA process and the path a drug takes to reimbursement within each country. The goal is to get safe and effective drugs to patients as fast as possible but, in some instances, the HTA process might elongate this time. Stay tuned for part three of this series where we will examine the timing and coordination between phase III clinical trials and global market access planning.